The cast of Bum Phillips All-American Opera. Photo by Corey Torpie. BOTTOM LINE: This new opera based on the life and career of NFL coach Bum Phillips hits some highs and lows in its quest to dramatize the life of this complicated man. As any lover of musical theatre knows, we constantly have to defend the genre from those among us who refuse to accept the conceit that any sane person would ever spontaneously break out into song. While it would be easy to simply write off the naysayers as idiots without a soul, the most constructive defense I have found is simply to say that musicals highlight the moments in life when mere words fail to do our emotions justice and we have no choice but rely on music to express the joy or sorrow that we feel. What keeps Bum Phillips All-American Opera from ever jelling into a cohesive and compelling piece is that the stakes rarely rise to such a level that the emotions of the characters warrant the outburst of song. This is particularly troublesome given that this new opera details the life and career of the late professional football coach Bum Phillips, complete with cheerleaders, greedy managers, and jealous wives. For an audience to buy that a Christian Texas football coach is so worked-up that he must sing in order to properly express himself, then he had better be seriously going through it. As it stands, it’s a tough pill to swallow. This is not to say that the passion and dedication of a football coach is a poor choice of subject matter for an opera or that this man’s life was without drama worthy of musicalization, in fact just the opposite. Pro sports are inherently dramatic and those who wind up in the leadership position must, in some way, thrive off of the drastic highs and lows. Mr. Phillips was no exception: an egotistical, competitive, and eccentric WWII veteran, a Christian once divorced and once remarried, the father of six, with a successful career as a pro football coach that notoriously fell short of the championship he felt he deserved. On paper, Phillips’s life seems rife with possibilities for emotional moments worthy of song. Yet composer Peter Stopschinski, librettist Kirk Lynn, and director Luke Leonard seem to have watered his story down, choosing to give musical life to the mundane, while passing over the peaks, leaving us wondering why in the world they chose this run of the mill dude to base an opera on in the first place. Luckily, the cast seems to be genuinely endorsing what they’re selling and is doing so with skill, enthusiasm, and humor. The ensemble sound, though not unpleasant, is lacking in strong male voices. The piece would benefit greatly from a cast able to sell rousing team choral numbers (if there were any), establishing a heightened sports atmosphere both in terms of sound and overall intensity that is desperately needed. Leading the team as Bum Phillips with a Texas sized baritone and a flat top haircut is Gary Ramsey who is unquestionably believable and performs with reassuring authority. As Mike Barber, Patrick Mulryan is managing an extraordinary feat of rising above the material. With a pingy voice and an impressive intensity, he gamely leads the bizarre, uncomfortable, perplexing, and vaguely offensive “Prisoner’s Chorus” as though it were something else entirely. And in what proves to be the most engaging and mystifying four minutes of the production, Alison Bolshoi playing Debbie Phillips makes a precipitous entrance deep in the second act to sing “Homecoming,” then disappears from whence she came, never to appear again until sauntering on for her curtain call. The physical production manages to be both sparse and fussy all at the same time. With production design by Luke Leonard and set and lighting design by Marie Yokoyama, the set consists of large florescent light boxes that are shifted around the stage throughout the performance and are mostly blue, occasionally distracting, but almost always completely irrelevant. 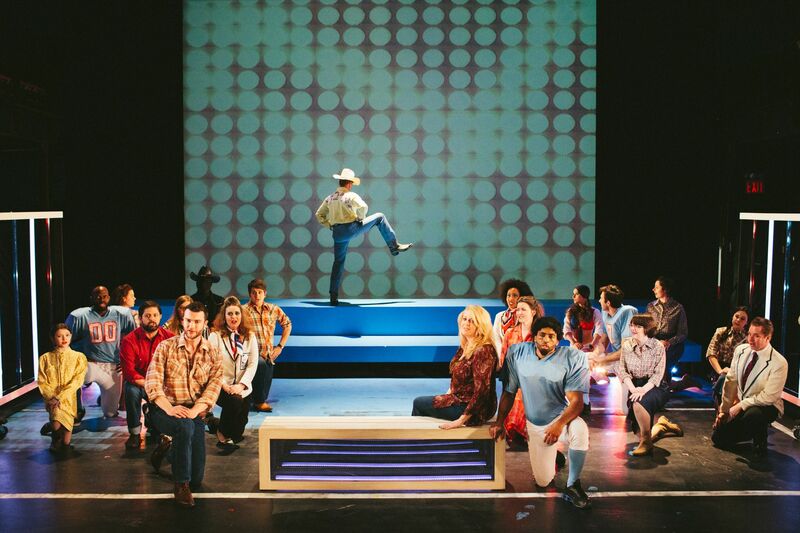 The costumes by Alison Heryer are a casual nod to the Texas of the 1970s when they might be an emphatic yee-haw. I am not sure whom to single out for the props as no specific property designer is credited, but if I could name names I certainly would. The props are universally distracting, cumbersome, and unnecessary, and I would suggest cutting them all. Cut every washing board, teacup, ice cube tray, cardboard car, armadillo, life size playing card frame, suitcase, metal house, metal football on a stick, in fact all the red metal objects can go along with the huge clear stands used to display these completely gratuitous objects. On the other hand, Darwin L Gilmore and Robert Brown’s projections are effective and underutilized; perhaps there is opportunity for expanding their purpose in lieu of all the props. I do not mean to come down too hard on this piece, and in fact there are some good things here and potential for a great deal more. Given the long and prodigious life the creators have chosen to dramatize, it stands to reason that there are hundreds of moments of heightened emotions available to justify and propel songs that have yet to be explored. In identifying and setting to music such moments to create a theatrical experience worthy of the man himself, while streamlining the tone and cleaning-up the physical production, I believe Bum Phillips All-American Opera could offer an audience a unique and thrilling experience.